You've found the “Canada Sebastopol Goose Breeders” page here at Hobby Farm Wisdom! If this is the first time you have visited our site: Welcome! 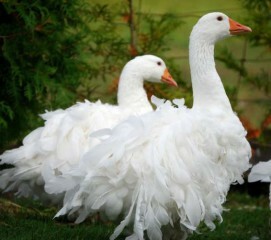 Sebastopol geese are a breed of domestic geese that are also referred to as Danubian geese. These birds are a medium sized bird with long, white curly feathers. Feathers on the neck are often smooth while feathers on the breast can be curly or smooth. The white variety of Sebastopols is the most popular, although there are buff and gray varieties. These are very elegant looking birds with the white feathers contrasting against blue eyes and orange feet and bills. Sebastopol geese are poor flying since their feathers make it difficult to get off the ground. To keep clean, this breed required a large amount of water as well as extra care during windy, wet and cold weather. With a quiet disposition, these birds are good layers of about 25 – 35 eggs annually. Can’t find the right Sebastopol Goose in Canada? Check in: Minnesota, Wisconsin, Michigan, New York, or Washington. Or, to see a list of ALL the Sebastopol Goose breeders in the US: Click Here!